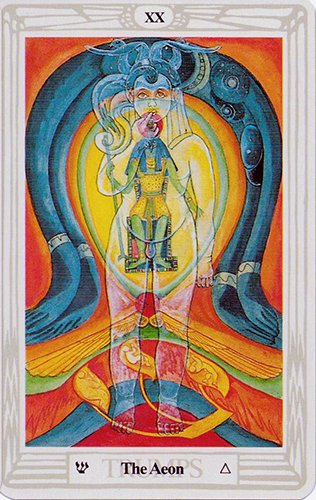 This card, the “Aeon” — the Thoth Tarot’s version of the Judgment card — refers to eternity, infinity and timelessness. In this version we meet the Egyptian star goddess Nuit, whose translucent form contains the image of the child-god Horus. Horus was conceived thru the union of Nuit and her mate Hadit (the winged ball of fire). This card relates to the endless human journey that we sometimes refer to as “karma.” We reap and sew with each thought, action, and decision. This card represents a summation of all that has come before, and an awareness that each step taken — from here on out — leaves an indelible imprint on our future. On a personal level, this card speaks of compassion, understanding, forgiveness and acceptance. It’s a card of rebirth and transformation, of getting in touch with your inner child, and of unconditional love. This is the “grace of God” card, which bestows infinite blessings on those who are able to recognize them. Even for those who are not, it is a powerful catalyst for personal growth and evolution. As Mercury and Chiron move into square aspect today you may be thinking about old mistakes and regrets. But the Aeon card speaks of atoning for your transgressions and washing away your “sins;” so that you too can be born anew.